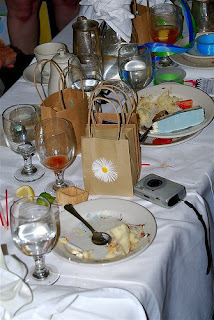 I felt like this photo of the aftermath of the wonderful baby shower I went to a couple of weeks ago was appropriate for the post Turkey Day FFF. Today is my annual post-Thanksgiving Depressurization Open House. There will be traditional Thanksgiving food, traditional Thanksgiving mimosas, good music, good friends and a good laugh here and there I'm willing to bet. I'm looking forward to it. Just a few loose ends to tie up before I'm ready to relax and laissez les bons temps rouler! I think I could really like a tradition that involves a mimosa! Enjoy the good friends, laughter and music!